Clarissa von Spee explains the significance of German expressionist sculptor Ernst Barlach's most important work, Der Schwebende (The Hovering), and how the work managed to survive the First World War. On display as part of the exhibition Germany: memories of a nation, 16 October 2014 to 25 January 2015. Der Schwebende ('The Hovering'), by Ernest Barlach, Güstrow Cathedral. ‘Everything is packed and we are on our way now!’ said a breathless voice on the phone, and it took me several seconds to realize that it was the chairman of the Ernst Barlach Stiftung Güstrow (Barlach Foundation). Güstrow Cathedral. Photo: Wikimedia Commons, User:Schiwago. This file is licensed under the Creative Commons Attribution 2.5 Generic license. On Monday 29 October the parish of Güstrow, in the north German state of Mecklenburg-Vorpommern, removed their famous Angel, a 150kg bronze sculpture suspended in a chapel of their cathedral, and sent it by train and ferry to London to be shown in the exhibition Germany: memories of a nation. The Angel arrived two days later in London. Too large to fit into a lift, the bronze was carried by no less than 8 well-muscled Heavy Object Handlers to the exhibition space. Güstrow, also known as Barlachstadt (Barlach city), was the hometown of Ernst Barlach, a German expressionist sculptor, whose most important work is his floating, or hovering bronze figure (Der Schwebende) made in 1926 to commemorate the victims of the First World War. Barlach himself fought in this war and returned a pacifist. 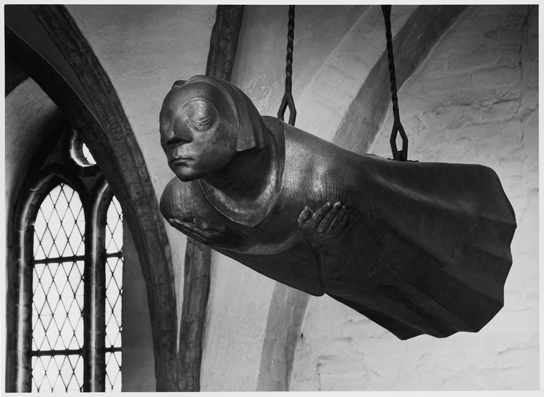 Der Schwebende (The Hovering), by Ernst Barlach, Güstrow Cathedral. Barlach’s memorial is unusual and unique. Detached from earth and time, with folded arms and closed eyes, the hovering figure expresses an internalized vision of the grief and sufferings of war. When the Nazis came to power in the 1930s, Barlach’s works were among the first to be declared Entartete Kunst (‘degenerate art’) and confiscated and removed from public display. Sadly, Barlach died in 1938, knowing that his masterwork had been taken down to be melted and probably made into war munitions. However, some courageous friends had managed to hide a second cast, which was then hung in the Antoniter Church in Cologne after the end of the Second World War. This time, the sculpture commemorated two World Wars. During the time of the Cold War in the 1950s, the parish of Cologne made another cast of the Angel and presented it in a gesture of friendship to the parish of Güstrow cathedral. For the next few months this cast is displayed in the British Museum’s exhibition. In 1981 Helmut Schmidt, the Chancellor of West Germany, met Erich Honecker in East Germany, and they visited Barlach’s Angel in Güstrow cathedral. On this occasion, Schmidt said to the bishop in Güstrow: ‘I would like to thank you very much for your kind words of welcome. As you said, Barlach is indeed part of our common memory of the past. May I add, that Barlach could also stand as a representative of our shared and common future.’ Schmidt was right. Eight years later, in peaceful demonstrations, East Germans brought the wall between East and West down. The sculpture also holds an additional message for us. The British sculptor Antony Gormley said in a recent talk at the British Museum: ‘If you want to know how it feels to exist beyond space and time, just close your eyes and look inwards.’ Try it, it works! In the exhibition, Barlach’s hovering bronze figure faces us directly, but its eyes are closed with arms folded over its chest. A perfect way to come to peace with the world. In the episode Barlach’s Angel, Neil MacGregor focuses on Ernst Barlach’s sculpture Hovering Angel, a unique war memorial, commissioned in 1926 to hang in the cathedral in Güstrow.